These two extremely quick and easy recipes (along with my trusty shortbread) have been my “go-tos” this Christmas season! They could not be more simple or more delicious! Dip biscuits in white chocolate or spread on top (please don’t look too closely at mine…) to look like custard on a pudding. Pop a jaffa on the top along with some sliced mint leaves to make it look like a piece of holly on the top. Make sure your chocolate is not too hot, or the jaffas and leaves will just slide right off! P.S. Not a good idea to keep them in the fridge as the jaffas can start to fade & turn white. So simple & quick to do, even the kids can join in with the making of this festive treat. Also makes a lovely gift. I have never been a fan of rocky road, but this one changed my view completely! My friend Lauren gave me some of this recently & I just had to get the recipe – now I just can’t get enough! Everyone loves it! Thanks Lauren! 1 large handful of unsalted peanuts. Halve each marshmallow and cut up the turkish delight into small squares. Mix with coconut & nuts. Melt chocolate and mix well with all ingredients until all ingredients are well coated. Spread out in a lamington tin and refrigerate until set. P.S. If you’re feeling guilty that festive Christmassy food seems to be sooooo bad for the waistline, check these Santa crackers out! 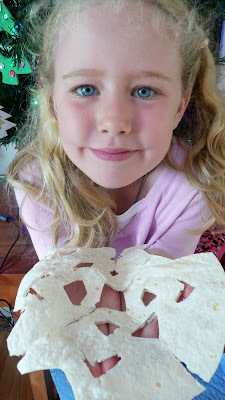 Just for something to do (you need those things during the school holidays…) Goose tried some of these quesedilla snowflakes for lunch yesterday which may or may not have looked just like the ones in the picture…. Pinned you a day or two ago so I could make those darling Christmas puddings. Just did it and I&#39;m thrilled with the results. These will be making an appearance at my work shared lunch this year. Thanks for the inspiration!